← Does God speak to us? Have you ever experienced God’s protection? I have, many times. Some have been very supernatural-out-of-my-hands rescues and others have been very “timely” deliverances. Mine usually happen in cars. I don’t know what it is, but my rescues have mainly been while driving. After I got saved, I started praying Psalms 91. If you haven’t heard of it and don’t know it, check it out. It starts out by talking about those who dwell in the secret place of God. Then it goes on to list all the things that God does for those who dwell there. Protection from things that happen in the world is in there. A very long time ago, I was driving my old El Camino on wet pavement. A car coming towards me was making a left hand turn and the nose of their car was in my lane. I was trying to stop….and skidding. I just knew I was going to hit them. I was resigned to it. Then my hands turned the wheel and I barely squeaked by. I say my hands turned the wheel, but I don’t believe I did it! I believe it was angelic protectors! Another time, the day before we were going to pay off a car, I was sitting at the top of a small hill waiting on oncoming traffic to make a left turn. I heard the squeal of skidding tires behind me. In my rearview mirror, I saw a car cresting the hill too fast and seeing me in his way, was trying to stop. The oncoming car got by me and I quickly made the left hand turn, just in time. I think the guy was going to rear-end me. Timing. God’s help. Another time I had a back end encounter with two semis who were driving too fast behind me while I sat waiting at a dead stop on a highway for someone in front of me to make a right hand turn into a little gravel driveway. Again, there was oncoming traffic and no way out, while in my rearview mirror, I saw the semi behind me start jackknifing as he approached my rear bumper….as soon as that car got past and the car in front of me turned, I hit the pedal. I was going 90 pretty soon just to get out of there. Those truckers scared me. Timing. God’s help, for sure. In 2012, by far the strangest one occurred. I was driving on a two lane returning from Evansville, when traffic came to a complete stop out in the middle of nowhere. I’m an impatient driver, I admit. I could not see what the reason for the stop was because the vehicle ahead of me blocked my vision. Impatient, I creeped up on his bumper. That might have saved my life. I was on the phone with a friend when all of a sudden a car careens by me on the right in the ditch, it’s nose pointed toward my car. (I call it a ditch, and it was, but it was a very wide ditch, wide enough to contain a car going sideways down it and not hit the cars sitting on the highway. Very odd.) I told my friend, gotta go, gotta go, as I watched the out-of-control car in my rearview. It popped back up on the highway behind me, still out of control, I thought it would hit my rear bumper. Instead, it careened back a bit and hit the truck that had slowed and stopped 2 car lengths behind me, smashing their front end, then flipped back and ended up in the ditch on the other side of the highway. The car in front of me “happened” to be full of men who were emergency responder guys. They immediately got their vehicle off the highway, got out and started directing traffic and checking the injured vehicles and occupants. All I could do was pull off onto a turn around place and wring my hands while waiting for police, and repeating oh, my gosh, oh my gosh. Long story short, the out of control car was driven by a young man who must have fallen asleep (and was on some potent drugs too, I hear), woke up in time to see he was in the wrong lane and took to the ditch. He must have been traveling at a high rate of speed too. He was sliding down that ditch at a pretty fast pace. Had my car been sitting farther back on the highway, I would have been hit. The ladies behind me were injured and taken out by ambulance. One still suffers after-effects of the accident to this day. I know this because she is now my neighbor at my shop in town. How’s that for God putting people together? I didn’t even know her when the accident happened. When I related my interesting day to my husband, he had a surprise for me. Apparently one or two nights before this happened, he had a dream. In the dream, storm clouds were approaching him and me, trying to put down tornado funnels on us, but they couldn’t. They kept trying, but they just could not reach us. Something (or some One!) was blocking it. Then the clouds turned and went the other direction, putting tornadoes down all over the place as they moved away from us. God’s protection. We believe that dream was a warning. I was safe and sound during the whole incident. I just watched it happen in my rearview mirror, almost like slow motion. Believe in God’s protection. Pray Psalm 91 for your family. If you are a believer and are following Him, obeying Him, you can expect Him to watch over you and keep you from harm. Your children too. 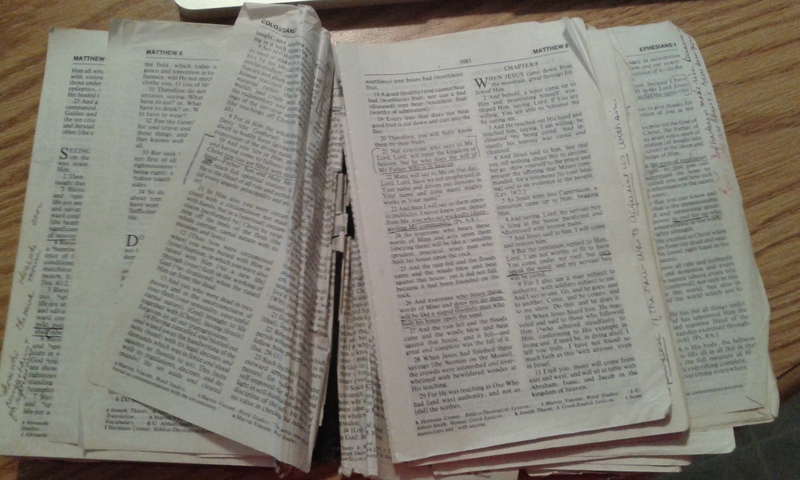 One more thing…they say that a bible that is falling apart usually belongs to someone who isn’t! This is my first Amplified Bible probably purchased about 1985 or so. This entry was posted in God's Power, Relationship with God and tagged believer, protection, Psalm 91. Bookmark the permalink.